This conference seeks to compare, contrast and juxtapose scholarly approaches to the art of Medieval and Renaissance religious women that have emerged in recent decades. Seeking to initiate a broader conversation, which is long overdue, we invite papers that examine female monastic art in terms of patronage, space, devotional practice, spiritual identity or material history, spanning all of Europe and bridging the gap between the Middle Ages and the Renaissance. Over the last three decades, within a broader scholarly effort to recover women’s history, art historians have explored the role of gender in the form, function and patronage of monastic art and architecture. It has become evident that the institutionalisation of late medieval and renaissance religious women developed under very different conditions from that of their male counterparts. Monastic foundations for women are repeatedly revealed as having been idiosyncratic, rarely adhering to a set of norms. There are many examples of stable and flourishing institutions performing functions of dynastic memoria for wealthy, aristocratic or royal families. Equally, female convents could be fluid and metamorphic during the course of their history: many instances demonstrate shifting ecclesiastical allegiances, mutable types of monastic life, movement between patrons, and even communities changing order. Such varied historical circumstances shaped the architecture for female religious communities, ranging from large complexes erected in the most fashionable styles of their time, to basic dwellings within converted secular buildings. Diversity can also be observed in the commissioning and use of works of art, from second-hand or adapted paintings to specially commissioned, lavish monuments and vast cycles of wall paintings. In short, artworks in the female religious context escape generalisation. 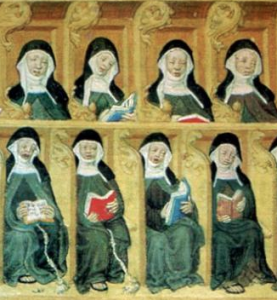 Idiosyncrasies are found not only when investigating the female monastic complex and its art, but also in the scholarship itself, which has primarily focused on chronologically and geographically specific material, often without engaging in dialogue with adjacent fields. North of the Alps, scholars tend to gravitate towards the rich Cistercian and Dominican material, and to concentrate on the interplay between visual culture and devotional practice. The 2005 exhibition ‘Krone und Schleier: Kunst aus mittelalterlichen Frauenklöstern’, and the accompanying conference, bore witness to the vibrant wealth of artworks preserved in the German-speaking areas of Europe, and should foster scholarly exchange with other European regions. On the Italian peninsula, the patchy archival record and damage to physical convent spaces has led to a proliferation of case studies. Renaissance and early modern scholarship has also focused on biographies of individual nuns or specific convent chronicles as means of investigating nunneries within the urban fabric of the Italian city-states from a socio-economic perspective. Meanwhile, the abundance of surviving artistic material in Spain, Portugal, Scandinavia and Eastern Europe has recently started to receive attention. The art of women who lived in a semi-religious context, such as tertiaries, widows, anchoresses and beguines, has also been brought to the fore. This abundance of recent work now invites comparison and wider interpretation. We welcome proposals for 20-minute papers exploring material across the stated time span, in all artistic media and throughout Europe, that deal with either case studies or broader methodological questions. Papers, which take a comparative approach, breaking the traditional regional or chronological boundaries, are particularly welcome. We intend to arrange the papers into panels that present contrasting approaches and/or differing time periods or places, to stimulate comparative discussion. Please send your abstracts of 250 – 300 words and a short biography of 100 words to Laura Llewellyn (laura.llewellyn@courtauld.ac.uk) and Michaela Zöschg (michaela.zoschg@courtauld.ac.uk) by 10 December 2014 at the latest. Unfortunately, we cannot offer travel subsidies. Applicants from outside London are therefore encouraged to apply to other funding bodies for travel bursaries to attend the conference.